OK, fast forward 2 years. 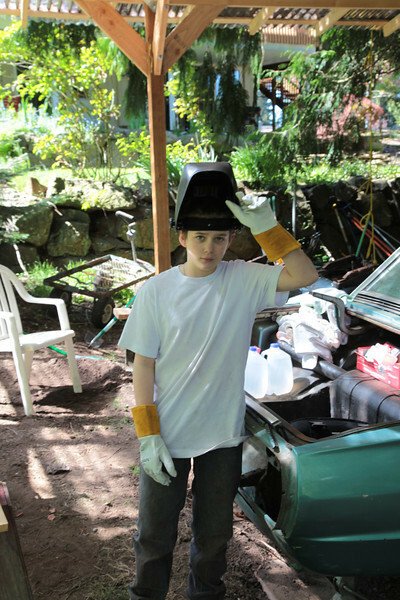 Last summer Nate and I build a huge carport (24'x36') so we'd have a dry place to work on the Thunderbird. We built it directly in front of the tool shed so we have power and tools close by. Now this summer we're finally we're getting going on the restoration. First we gut the interior and cut out the rusted floorboards. Nate is now age 13 and I'm feeling pressure to get going so it's actually done by the time he's 16. He is also starting to gain confidence with more tools like the torch, the cutting wheel and angle grinder. See all of Nate's TBird Galleries . OK, getting geared up to weld in the new floor panels. You can also see a bit of the structure of the carport we built.